A scrappy New York taxi drivers union is taking on Uber's exploitative business model — and winning. On August 14, the scrappy but militant twenty-one-thousand-member union representing taxi and for-hire vehicle drivers in New York City won a landmark legislative victory establishing the country’s first cap on ride-sharing company vehicles and essentially forcing them to pay their drivers a minimum wage. This fight pitted the Taxi Workers Alliance against corporate giants Uber and Lyft, which together employ more lobbyists than Amazon, Walmart, and Microsoft combined. There is little wonder why. New York City is Uber’s largest US market, and the number of Uber and Lyft vehicles on the streets has exploded in recent years, from twenty-five thousand in 2015 to eighty thousand in 2018. Since neither Uber nor Lyft considers their drivers to be employees — instead classifying them as “independent contractors” — both companies have avoided paying Social Security and payroll taxes while stripping their drivers of minimum wage and overtime protections as well as the right to organize a union and collectively bargain a contract. A city-commissioned study found that 85 percent of New York app-based drivers are earning below the minimum wage. The companies have also made life miserable for many taxi drivers. As the number of Uber and Lyft vehicles has risen, the value of taxi medallions has plummeted. Once a prized asset for aspiring working-class families, medallions that once sold for $1 million are today selling for $200,000. 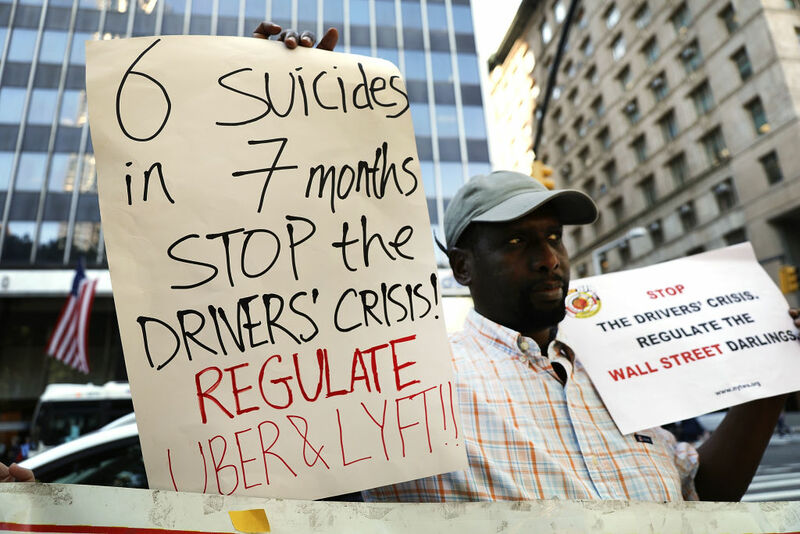 Driven to despair by unregulated corporate growth, six New York City drivers have taken their lives in recent months: Abdul Saleh, Yu Mein Kenny Chow, Nicano Ochisor, Danilo Corporan Castillo, Afredo Perez, and Douglas Schifter. New York City is the first to put a cap on for-hire vehicles. Can you talk about what this legislation does and why it’s important? What kind of permanent regulation would you hope comes from this? It’s hard to say right now, but the TLC could place a permanent limit on the number of for-hire vehicles on the road. It’s going to be important that we settle on a permanent cap on for-hire vehicles that makes sense for everyone — one that lets everybody making a living, that stops the current race to the bottom, and that not only lifts standards for app drivers but all drivers across the industry. It seems like part of what gave the city council a sense of urgency was the fact that six drivers committed suicide. Do you think that’s fair to say, and do you think this cap could save lives? You can’t look at Uber and Lyft in a vacuum. Part of what’s happened over the past three years is that taxi drivers have been made to feel invisible. The six drivers who committed suicide were yellow cab, livery, and black car drivers. Part of what drove them to despair was this feeling that the deterioration of their livelihoods was not visible to policymakers or the community. Over the past three years, Uber and Lyft have presented themselves as socially conscious corporations while they have been rendering drivers invisible. That’s obviously intentional, since they want automation in the long run. One of the most important progresses we made is putting the drivers back in front — as the visible face of their industry and in the organizing campaigns to regulate these companies. We’ve also been putting together a mental health program. When drivers see our flyers, they see that the Taxi Workers Alliance is fighting for change in the industry and that they’re not alone. But we also provide information on bankruptcy and a suicide hotline on every flyer. No union should have to organize under those conditions. This has been such a spiritually enlightening campaign. Watching families who lost their loved ones to suicide, it’s such a personal grief and given that suicide is something that most people are socialized to keep private, these families have taken their darkest hour, shared it publicly, and stood strong the entire time. I grew up poor so I don’t take for granted the economic struggles that we as a movement wage to keep food on the table. But when you’re on a campaign that is literally about creating hope so members stay alive, then failure is never going to be an option. The Taxi Workers Alliance was also responsible for passing the first legislation to establish a minimum rate of payment to app drivers, right? That’s right. We not only placed a cap on app-based for-hire vehicles, but we established the first minimum pay requirement for those app drivers. That means the companies can’t keep lowering the rates by which they pay drivers and in establishing those rates through rule-making, the Taxi and Limousine Commission will consider drivers’ expenses and their right to earn a livable income post-expenses. The same bill also authorizes the TLC to regulate the app passenger fare at the end of the twelve-month study. As long as the passenger fare remains unregulated, the companies can keep dropping the rates, locking out drivers in the competitor sectors from getting a raise, as taxi and livery drivers would be too afraid that Uber and Lyft would just lower rates if their rates ever went up. We fought for all drivers to get a raise and won legislation to make that possible. We’ve beat Uber and Lyft in labor court, and we’ve beat them at city hall. These are some of the highest-valued companies in the world. They get obscene amounts of money from Wall Street. So many in the labor world said you can’t organize these workers and you can’t beat back these companies, but here we are, a motley crew, a grassroots, worker-led movement and we defeated them because we never gave up. We refuse to make compromises. If Uber and Lyft had to contribute to unemployment insurance and all the drivers that couldn’t make ends meet were receiving unemployment, then that would have been a major disincentive for the profit strategy that both companies have pursued. It’s easy for them to glut the market with drivers because they aren’t employees of Uber. Otherwise they’d have to pay taxes for them, and they’d be on the hook for them. Misclassification, over-saturation, and deregulation of the fares are at the heart of Uber and Lyft’s business model and are the main causes of the impoverishment of drivers. They have been team Uber. When they saw we were going to win on the cap, they turned around and said, “We support that.” But meanwhile, they’ve been saying they want the city council momentum to end. Until a couple weeks ago, they were saying all that should be done is a minimum-wage requirement set by the TLC. Uber has responded to the Taxi Workers Alliance’s efforts by launching a seven-figure public relations campaign highlighting many of the legitimate grievances felt in black communities about driver bias and being denied rides. Uber also had the support of prominent leaders of color, like Al Sharpton and Spike Lee, who stumped for them against the cap. How do you respond to these criticisms, and what is the plan for addressing them? We were able to break through Uber’s ploy because we had many council members of color who we had several conversations with over the course of many months. And we put together a nine-point civil rights initiative where point nine was, we didn’t call it an office of inclusion, but an office at the TLC that would oversee this program that included training, continuing licensing requirements, a renewal course, and community service as well as development of the technology for electronic hailing of yellow cabs. The Taxis for All Campaign, they’re amazing. We’ve been in partnership with them for over ten years. We worked with them to bring a mandate that 50 percent of yellow cabs be wheelchair accessible by the year 2020. So they’ve been supporting this campaign all along, and they are remarkable people. We are one of the few global cities that doesn’t have the level of accessible service that it should. Uber and Lyft fight accessibility passionately across the country — not just wheelchair accessibility, but signage requirements, because taxis have to meet a braille signage requirement. I don’t want to overstate their commitment to it, but I do think that accessibility is something that the city council has acknowledged to be a standard that app companies should be required to meet. Of course, the app companies have fought that standard and they used the IDG do it. The IDG said they were against the TLC’s accessibility mandate because that would make costs go up for drivers. But why not fight your employer so that they have to absorb some of those expenses? Why is it a given that the IDG assumes all expenses have to fall on drivers? In the taxi industry, drivers were found to be independent contractors, and so we’ve focused on TLC-level regulation. Since 1997, we’ve won caps on all the different expenses that drivers have to pay. In 2012, we won caps on the financing expenses that drivers pay on vehicles. We didn’t just assume that drivers have to eat these costs. Since day one, we have refused to believe that Uber and Lyft couldn’t be brought under control because we were able to change an entrenched medallion industry. If we were able to make changes there, why wouldn’t we be able to do it with these companies? It’s still stunning to think that a twenty-one-thousand-member union has taken on a $70 billion corporation in New York City. Since November, we’ve had over twenty actions. We didn’t even send our first letter to city council until April. They saw our fight and on our demonstration posters, they saw our platform. The eleven-point council package comes directly out of our demands list, including first-time regulations against predatory lending in the for-hire industry, similar to protections we won in the taxi industry, and a health and benefits fund for all drivers across the industry. We’ve been hitting the streets because we knew this was going to be a public fight. These men and women, when they take time off work, they lose income. When you’re a yellow cab driver, you’re paying a lot of expenses. When you’re an app driver, you’re paying a lot of expenses. And time you aren’t working is time you are losing income. Yet our members turned out to action after action with their families. We won because of our commitment. Bhairavi Desai is the executive director of New York Taxi Workers Alliance.